Have you ever arrived somewhere new, got all settled in to your hotel or Air B&B and realized that you’re missing something important? Packing everything you need for traveling can be a daunting task because sometimes you just don’t know what you might need on your trip – until you need it. 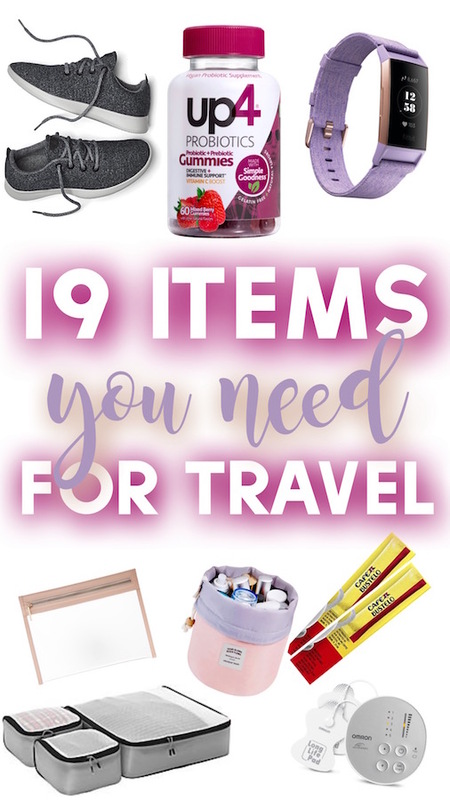 While I still stand by my article, 17 Items You Need for Travel – here are 19 more things you might not want to find yourself without when traveling. There are heaps of different converters to choose from but I particularly love this multi country converter that even comes with two USB ports on top of the outlet that converts to the proper outlet for 160 countries. If you, like me, find yourself working and with #AllTheThings to charge on your trip – this 220V – 110V converter with three outlets and four USB ports is definitely the way to go. I love to shop – I admit it, I own it, it is what it is. I tend to shop when I travel and as such I, typically, come home with more than I left with meaning a collapsible bag to fill up and take home is usually one of the greatest things I pack. I have my favorite collapsible bag in my The Best Handbags and Carry-on Bags for Travel article because I love it that much. Not only does it collapse to a very small bag, but it can also expand twice. But, if designer isn’t the way to go for you – you can opt for this foldable, lightweight, waterproof collapsible bag – which at a price-point of less than $12, would almost be silly not to pack. 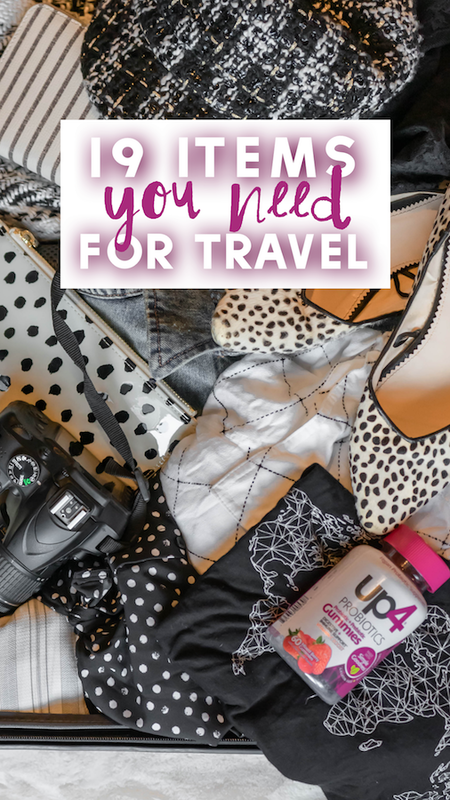 Last year I had up4® Probiotics on my Carry On Essentials list for travel, but this year, the up4® team released my new favorite probiotic, up4® Prebiotic + Probiotic Gummies. 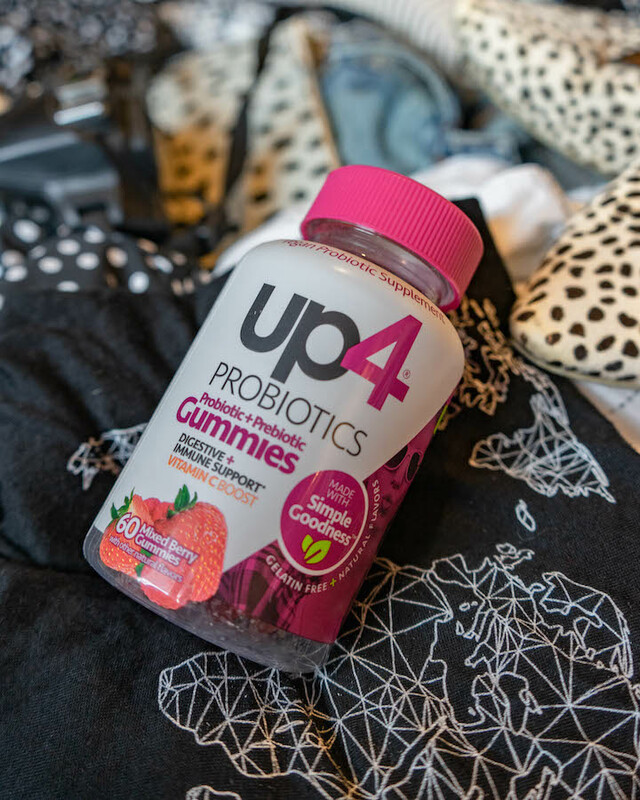 The up4® Gummies have all the benefits of a probiotic supplement (supporting your digestive health and relieving occasional digestive discomfort*—necessary for travel) and are also gelatin-free (and vegan!). They also have an add-on of vitamin C which helps to support your immune system*—another necessity for travel. To top it all of, they are made with clean ingredients, work naturally with your body and are delicious. What more can you ask for? 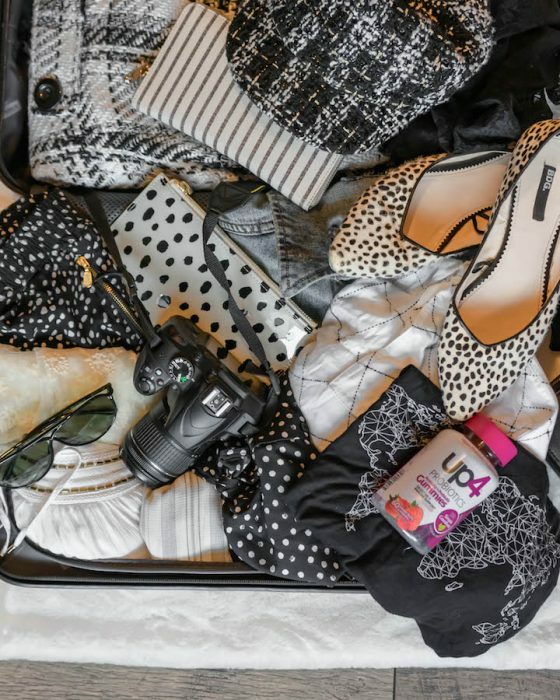 No matter where I’m heading – I always have my up4® Probiotics Gummies in my bag and ready to go! I had Allbirds Wool Runners on my Stylish Traveler Gift Guide because truly everyone I know who rocks Allbirds are stylish and trendy people. Not only are they super comfortable but they’re easy to dress up or down and since they’re not synthetic – they’re machine washable! I LIVE FOR COCONUT OIL. I’ve included it on round ups before, and I’m sure this isn’t the last you’ve heard of me endorsing coconut oil. I recently tried out a sample pack of Kopari Products and fell in love with them. The products are much more convenient for travel than the large glass ball jars coconut oil typically comes in and according to them, “Kopari uses only the highest-grade coconut oil to create natural products that feel good, smell intoxicating, and perform like a dream”. A statement I fully support and endorse – and with good reason as I tested these products out on a very dry, very cold, week where temps were averaging about 20 degrees (Fahrenheit). I like to think that in a past life I was a weather forecaster because I happen to be very good at it (thanks to my Accuweather App). I love how the app breaks down the incoming moisture with a “minute by minute” play. You can also check the sunrise and sunset time – which is great to plan around when you’re traveling! You can use this link to take you to the app download page from the Google Play, Apple iTunes or Windows App store for free. 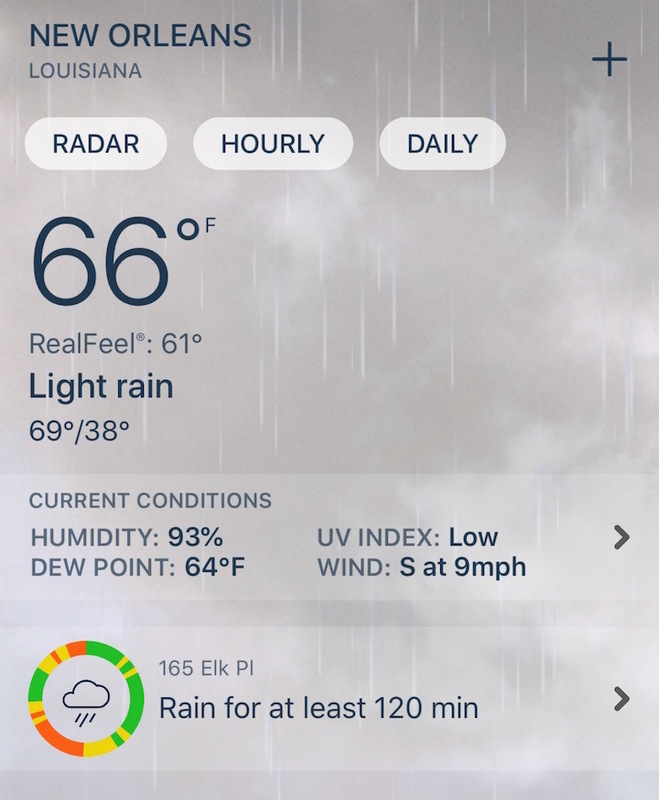 On the off-chance you get stuck with this much rain in New Orleans, like I did, you’ll be thankful your Accuweather app tells you how heavy the rain is and how long it’ll be raining for. “Jackie, what?” I know what you’re thinking here. But, it’s not until you’re halfway around the world in need of scissors and tape, with no OfficeMax in sight, that you start thinking you probably should’ve planned ahead. You literally never know what you might need scissors for – in my case it was to cut a very itchy, extremely reinforced, tag off of a shirt. And tape? Great to reinforce your toiletries lids as a secondary precaution and even further can be used as a lint remover, a temporary hem, can fix a tent or bag in a pinch and you can even tape valuables to the bottom of a table if you’re worried about safety. These folding scissors are perfect for travel because you don’t have to worry about stabbing or cutting yourself when searching for them in your bag. Unless you’re living under a rock, you’re probably aware that our planet is in crisis mode and plastic anything is one of the most harmful items we can use. Many places are starting to ban plastic straws and other single use items but one way to step up is to travel with and carry your own metal straws. These Simply Dope metal straws totally earned their name and even come with a cleaning brush! I’ve been using the Rosetta Stone App to learn Italian and I’ve been loving it! The app is super user-friendly and makes learning the basics of any language not only seamless but also fun. I definitely suggest brushing up on the language of a place you’re traveling to before you depart. Kind-of self- explanatory here but again, just to reduce the amount of single use plastics, ditch the hotel “laundry bag” and bring your own laundry bag. This hanging laundry bag even has a separate compartment for a wet bathing suit or for diapers if you’re traveling with kids. 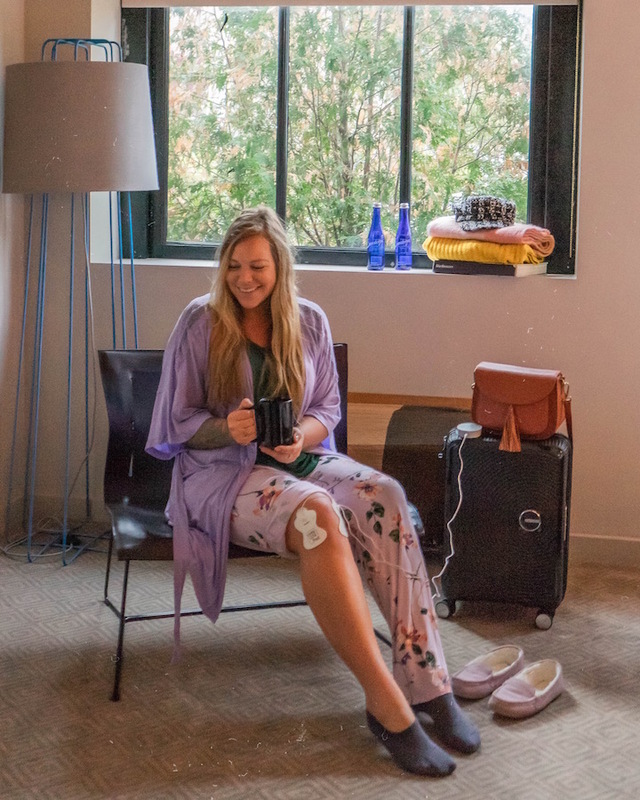 Not only do I have a bum knee but I also have a herniated disc in my back and ever since I started traveling with my Omron Pocket Pain Pro my pain while traveling has been much easier to manage – especially without any oral medications. The Omron TENS device is a super easy way to relieve achy, stiff or sore muscles and is super lightweight and easy to carry around anywhere you go. My Omron Tens device is perfect to use in a hotel or on the go. A good watch is a great accessory, wherever you may be, but sometimes when traveling catching the time might be difficult. Your phone dies, you’re in a small village in Italy where afternoon Siesta is in full swing and you lose your bearings without knowing the time. A simple rose gold watch is a great way to make sure you’re always on time – even if you’re not connected. A FitBit watch is a great way to keep track of the time while keeping track of your steps and activity while you’re away! I fell in love with this Usana Sensé Intensive Hand Therapy cream during our extreme cold front this winter. Not only is it super moisturizing, it’s not greasy and has an awesome light lavender scent. Let me be clear here I don’t mean single use plastic zip tie bags! When it comes to travel – organization is key, and nothing can help keep you organized the way that clear organizing bags can. This Clarity Jetset Case is TSA approved so you can head to your next destination with clarity that you’re in compliance with carry-on rules and regulations while having clarity if you need to find something in your bag quickly. This makeup bag is one of my favorites and also found its way onto my Gift Guide for the Beauty Obsessed Traveler. It’s less than $10, comes in a few colors and can organize your beauty and skincare products super easily. I’m a bit of an espresso addict and sometimes I just can’t find a strong enough coffee when I travel (or even worse I can’t find any). I started traveling with these Café Bustelo espresso Instant Coffee packets and I KNOW WHAT YOU’RE THINKING AS YOU READ ‘INSTANT COFFEE’ but please don’t judge before you try it (like I did – haha). They’re really good and the perfect fix when you can’t get your hands on a cup of coffee. I recently received this amazing jewelry organizer in a FabFitFun box and now I’m legitimately obsessed with it and don’t know how I ever traveled without it. It makes it super easy to organize your jewelry and it’s not bulky at all. I know it sounds so simple but the addition of a hanger on your makeup bag or toiletry bag is the greatest thing ever. This one is great because it has heaps of pockets so your products will stay organized and this one is awesome because it has all the space you could need and would easily work its way into a suitcase without being too bulky. I’m going to reiterate this on every round up I ever do, forever, until everyone uses and swears by packing cubes the way that I do. This is a great set of packing cubes for less than $16 and it even comes with a handy laundry bag! All in all, I’m more of a “better safe than sorry” type of person when packing for my travels. I’d rather have something I don’t use than need to find something I don’t have, especially in a foreign country. I can also pack fairly light (I didn’t pay any over-weight bag fees in 2018!) so it is for sure possible to have everything you need without weighing yourself down. Disclaimer: This post was written in partnership with up4 Probiotics. My opinions, as always – remain my own. Also! This post contains affiliate links which means that I may earn a small commission, at no extra cost to you, should you make a purchase. I ride or die for the products I recommend which means I’d never suggest something I don’t personally love.